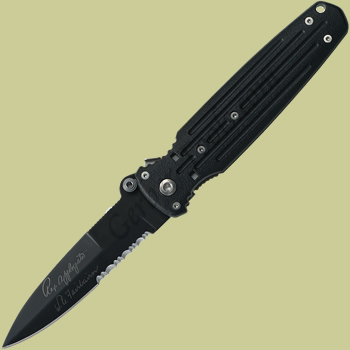 Covert - Double Edge 154CM, Black, Serrated 05786. The Gerber Applegate Fairbairn series knives are recognized worldwide for their superior strenth in the tactical folding knives class. This Gerber Applegate Fairbairn model 05786 has a double beveled, partially serrated black blade made of 154CM stainless steel. The blade is locked with a roto-lock locking system, and the handle is made of black glass reinforced nylon. A pocket clip is included and how this knife is carried.